A pulley, some marbles, a paint stick -- all the things we’d need for a science project. We started our search locally. On the way, I saw a bicyclist holding an infant in one arm and balancing a toddler on the frame. Minutes later I saw an elderly woman perched on handlebars being petaled down a bumpy dirt road. At the hardware store, we gave the clerk our list. Many stores here are set up like Ike’s Grocery on Waltons Mountain, where shopkeepers retrieve items for you while you stand and wait. We didn’t have to wait long; no pulleys or paint sticks. 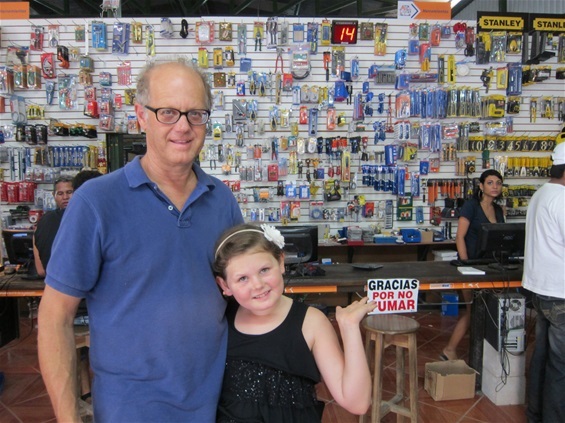 As for marbles, I learned how to say the word in Costa Rican and Nicaraguan Spanish, but in the 10 stores we visited between here and Liberia, there weren’t any. Finally we stopped at the mechanic who fixed our car a few months ago, and he gave us a ball bearing. Let the construction begin!